John N. Parker pocket diary, September 1861-August 1862, while serving as a Sergeant with the 4th Regiment Rhode Island Infantry. 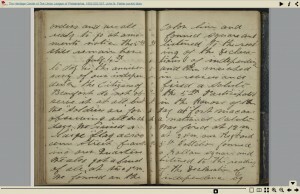 The diary documents Burnside’s expedition to Hatteras Inlet and Roanoke Island in North Carolina (January 7-February 8, 1862), the Battle of Roanoke Island (February 9, 1862), the Battle of New Berne (March 14, 1862), and the siege, bombardment, and capture of Fort Macon (March 23-April 26, 1862). fol. 4r — New York, New York; Washington, D.C.
fol. 5v — Washington, D.C.